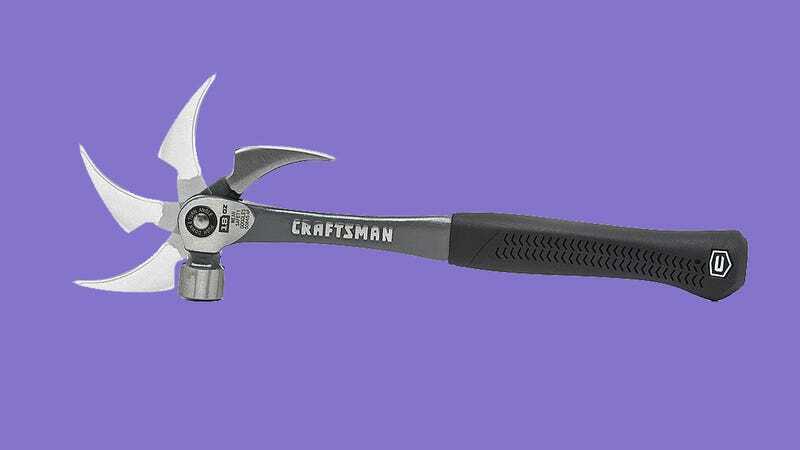 The claw hammer’s design has gone mostly unchanged for over 500 years, but Craftsman believes it’s finally time for an upgrade. The introduction of a pivoting claw on its new Flex Claw Hammer lets you maximize your leverage when removing nails or prying boards at awkward angles. The pivoting claw on the $20 hammer locks into one of four positions so that it’s not moving around or loose while you’re trying to exert pressure with it. The lowest position also helps reduce the overall size of the hammer’s head, allowing it to be used in tighter spaces. Below the Flex Claw hammer’s striking face you’ll also find a groove and a magnetic nail starter making it easier to drive a fresh nail when you’ve only got one hand free, or don’t have the confidence in your aim or skills to hold a nail in place and put your fingers at risk of being hammered.